Few legal events loom as large in early modern history as the trial of Galileo. Frequently cast as a heroic scientist martyred to religion or as a scapegoat of papal politics, Galileo undoubtedly stood at a watershed moment in the political maneuvering of a powerful church. But to fully understand how and why Galileo came to be condemned by the papal courts-and what role he played in his own downfall-it is necessary to examine the trial within the context of inquisitorial law. 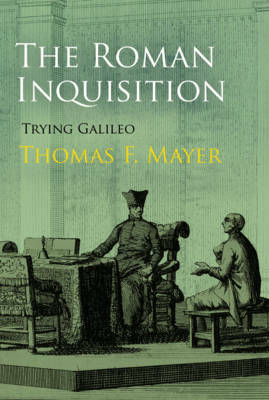 With this final installment in his magisterial trilogy on the seventeenth-century Roman Inquisition, Thomas F. Mayer has provided the first comprehensive study of the legal proceedings against Galileo. By the time of the trial, the Roman Inquisition had become an extensive corporatized body with direct authority over local courts and decades of documented jurisprudence. Drawing deeply from those legal archives as well as correspondence and other printed material, Mayer has traced the legal procedure from Galileo's first precept in 1616 to his formal trial in 1633. With an astonishing mastery of the legal underpinnings and bureaucratic workings of inquisitorial law, Mayer's work compares the course of legal events to other possible outcomes within due process, showing where the trial departed from standard procedure as well as what available recourse Galileo had to shift its direction. The Roman Inquisition: Trying Galileo presents a detailed and corrective reconstruction of the actions both in the courtroom and behind the scenes that led to one of history's most notorious verdicts.